Plan de Corones / Kronplatz is ideal for lovers of the outdoors. Between the Zillertal Alps (Austria) and Italy’s Dolomites, it’s mountain scenery at its best. Plan de Corones (Kronplatz in German), is situated within the Pustertal Valley in South Tyrol, Northern Italy. Pustertal Valley runs from Lienz in East Tyrol (Austria), right through to Mühlbach in South Tyrol (Italy) and is flanked on either side by the mighty Zillertal Alps and the sharp, majestic peaks of the Dolomites on the other. Despite its Italian location, Plan de Corones / Kronplatz has a distinctly Austrian culture, and over 80% of the population speak German. As you might expect in this incredibly mountainous terrain, walking and other outdoor activities are plentiful. These activities can be enjoyed for most of the year; apart from winter, when the Plan de Corones transforms into a bustling ski resort. In fact, the ‘Dolomiti Superski’ is one of the most famous in the country, and has over 1,200 km (746 mi) of slopes! In the warmer months, walkers naturally gravitate towards Mt. Kronplatz (2,175m/7,136ft), which has plenty of hiking trails, not to mention some of the most impressive views in the region. However, there is more to Plan de Corones / Kronplatz than just the mountains. With three nature reserves in the area, there are plenty of opportunities to enjoy strolls through the surrounding forests and meadows to look out for the local wildlife, not to mention take in the sights of the lakes and waterfalls. There are several villages and towns in the area to stay in during your holiday; one of the more popular choices is the Pustertal Valley’s largest town, Brunico (Bruneck in German), which is at the confluence of the River Rienz with the River Ahr, and enjoys a lively social scene and beautiful surroundings. The mountainous landscape surrounding Plan de Corones / Kronplatz lends itself perfectly to hiking; and there are many trails in the area, ranging from the extremely challenging to easy rambles. Nordic walking is also a common pastime in Plan de Corones / Kronplatz, and the ‘Kronplatz Dolomiti Nature Fitness Park’ is the perfect place to enjoy this activity. With 275km (171mi) of trails, it’s the largest of its kind in Europe and features a wide range of routes, from easy paths, to more challenging trails with different elevation profiles. Plan de Corones is a magnet for outdoor enthusiasts. The walking is among the finest in Northern Italy, and there are also plenty of other activities for visitors to enjoy. Pustertal Valley itself is famous for its excellent cycling, with several forest paths and well-marked cycle tracks to explore, and there is also a free-ride trail for those seeking a more adventurous cycling experience. 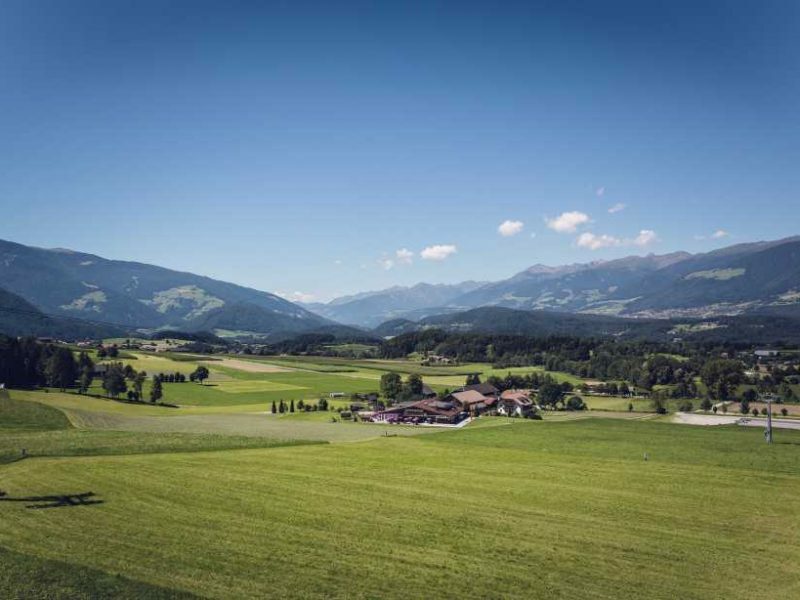 Another major outdoor activity in the Kronplatz region is horse-riding; and horse lovers will be delighted at the number of equestrian centres in the area, most of whom offer guided tours through the surrounding landscape. At the Golf Club Pustertal, just outside Brunico, there is a 9 hole golf course, set amidst some wonderful mountain scenery; or for something rather more fast-paced, thrill-seekers can try out the zip-wire running from San Vigilio di Marebbe to St. Vigil in Enneberg, which at 3.2km, is the longest in Europe. If you are the kind of person who saves extra suitcase space for a bit of holiday shopping, then you’ll be delighted to know that the towns of the region offer plenty of souvenir- and other shops. The cuisine in the area is particularly renowned. Blending both Austrian and Italian influences, it also has a distinct taste of the local Ladin cooking thrown in for good measure. The South Tyrol Museum of Folk Traditions (Südtiroler Landesmuseum für Volkskunde) in Brunico is also an excellent way to pass an afternoon. The museum, based in an impressive pink baroque-fronted building, features exhibitions detailing the history of the region and its people. Plan de Corones / Kronplatz is fairly easy to reach and has many international airports in the near vicinity. Innsbruck Airport is only 110km away (68mi, approximately one hour’s drive) and Venice Treviso Airport is 195km away (121mi, approximately 2 hour’s drive). Fortezza is the closest train station with international connections; and from here, it’s possible to catch a local train to Brunico. Alternatively, there are a number of taxi companies in operation in the area. If arriving by car, the region of Plan de Corones / Kronplatz is well served by main highways and roads. The state road SS49-E66 leads directly to Brunico, which can be accessed from both the Brennero motorway (A22) and the road from Lienz (B100-E66).